Modern biochemical research is based on the premise that life can ultimately be explained as a coordinated series of chemical reactions. Historically, biochemistry began in the 19th century with the chemical description of biological compounds and the study of metabolic pathways. The field grew steadily through the first half of the 20th century, then explosively after the discovery of the genetic material that is DNA. Today, biochemistry includes the structure and function of the protein, RNA, and membrane components that carry out life processes (structural biology and biophysics). It also includes regulation of the genes that encode these components (molecular and systems biology), functional integration of these components within cells and tissues (cell and developmental biology), and coordination of the myriad components responsible for complex behaviors in unicellular and multicellular organisms (neurobiology, immunology, physiology, and microbiology). Just as importantly, progress in basic science has inevitably led to progress in understanding the causes, diagnosis, and treatment of human diseases as diverse as cancer, obesity, muscular dystrophy, and malaria. 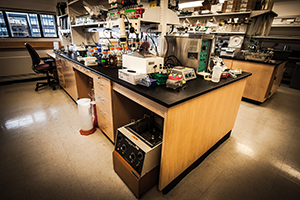 The Department of Biochemistry at the University of Washington has contributed to many phases of this research. Initially recognized for incisive studies of the structure and function of proteins, and the mechanisms of enzyme action, the department branched out into a multitude of other areas. These included: developmental biology of flies, fish, frogs, and mice; molecular mechanisms of aging in yeast and mammals; vertebrate visual and immune responses; chromosome dynamics, cell division, DNA replication and repair; energy transduction during photosynthesis; protein secretion and membrane fusion; translational control and regulated protein degradation; protein structure determination by crystallography and NMR spectroscopy; and protein structure prediction and enzyme design. Our diversity of interests guarantees a rich intellectual and educational environment. Graduate education is an especially strong tradition within the department, and our graduates occupy positions in universities and research centers around the world. The faculty has received recognition at many levels, from membership in the National Academy of Sciences to many honorary degrees and awards. Two of our faculty members and one former student have been awarded the Nobel Prize. We are excited by our own research, as you can see by examining the current research statements of the faculty. A conspicuous spirit of collegiality and experimental collaboration prevails both within the department and throughout the university, assuring an energetic, integrative, and enjoyable research environment.